Lent has traditionally been a time to give something up. However, it seems that more and more people are taking a new approach to the 40 day period by taking up a new activity or pledging to be more generous. And Lent campaigns such as the 40acts challenge from Christian charity Stewardship, are challenging people to do just that. Launching for its seventh year on Wednesday 1 March 2017, 40acts challenges people to do a simple act of generosity each day during Lent and already has over 110,000 people across the world signed up. Participants receive a daily thought from one of 40 different Christian writers, thinkers and leaders, alongside a generous act to complete each day of Lent to encourage them to think outside of themselves and ‘give out’ rather than just giving something up. Through simple acts like saying thank you, talking to strangers, sharing a skill, forgiving people and sending anonymous gifts, the campaign hopes to make living generously a daily habit. Those taking part can share their completed acts on Facebook, Twitter, Instagram and Snapchat. This year Stewardship has released new 40acts resources for church groups, small groups, and families. Youth groups and schools can also take part. Individual participants can sign up to 40acts via 40acts.org.uk and will receive emails from Wednesday 1 March to Saturday 15 April 2017. They can also see the daily challenges on the website and social media sites. 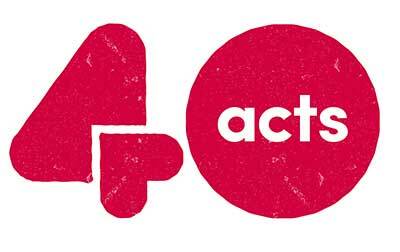 Visit www.40acts.co.uk for more information about the campaign and to get involved.